Many of us are still experiencing record high temperatures all over the U.S. So the Poo-bahs at Opus are right on track with their challenge. 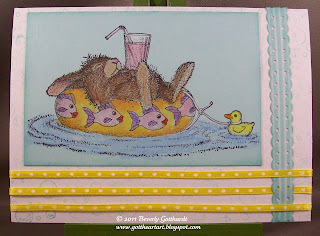 I stamped the little bunny on Pool Party card stock with black ink and colored him with my PrismaColor pencils and blended with Sansodor Low Odor Solvent. I couldn't resist stamping some bubbles on the background very lightly. This was the perfect stand alone image for the sketch at Tuesday Morning Sketches. Speaking of Tuesday Morning Sketches--I bet you've heard the clapping--the team over there picked my Sunny Day card with the detachable bookmark for 1st place last Tuesday. I got a cool blinkie badge for my side bar and Melissa says I get a guest spot, plus I won 5 digis from Doodle Pantry, how cool is that! Those are some of my favorite digis, not to mention Laurie the owner and designer is one of the most generous ladies I've ever encountered. Stay hydrated and cool wherever you are. Very timely and so cute! It's been in the 90's all week here in Michigan and soooo HUMID! Yuck. Supposed to hit 98 tomorrow. Nothing compared to Texas, I know, but us Northerners are not built for this! LOL! Adorable card! 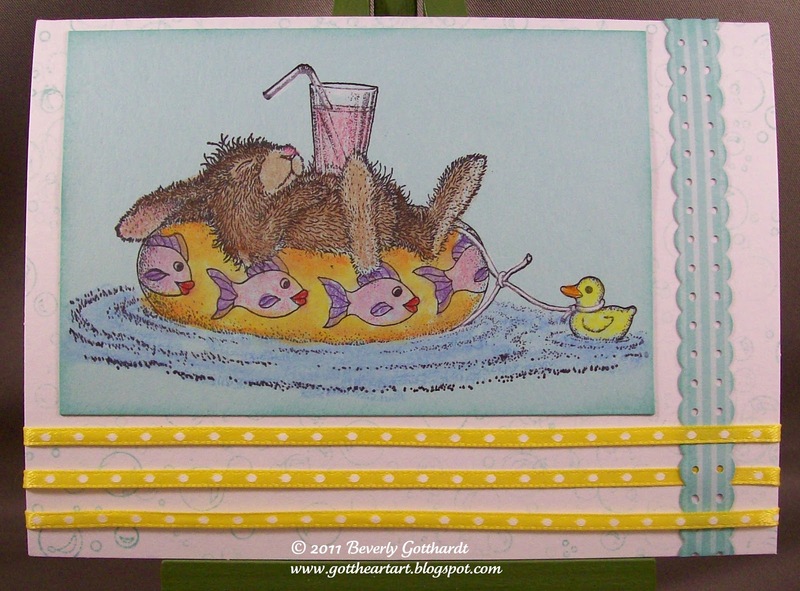 I wish I was sitting on an inner tube with a cool drink! Thanks for joining us at TMS this week! LOL she's got my tummy, well mine's not quite that hairy! Lovely card and the yellow ribbon at the bottom makes your card POP! Fabulous Beverly! He looks so relaxed. Thanks for joining us at Tuesday Morning Sketches. loving this little mouse- so cool and relaxed looking...thanks for playing along with the Beat the Heat Challenge at the Opus Gluei this week! Hi Beverly! I always get happy to see one of your creations listed in the submittals because I know I'm going to see something to make me smile and inspire me to go and play with my stuff. Yep, you did it again! Love this little guy, what is it about the swim rings? I love my cat one and this bunny is so cute! I think the bunnies living in my yard are ready for a little cool dip as well - so blazing hot here - you just wanna melt. Anyway, you know me, I tend to ramble but let me say we love having you play with us at Opus Gluei! We'll have a new challenge up this Saturday!